The Blue Room is the center of the State Floor of the White House. Over the years, the Blue Room's oval shape and breath-taking view of the South Lawn of the White House has captivated many visitors. The Blue Room has been the traditional place for presidents to formally receive guests. From entertaining kings to shaking hands with the masses, the business of democracy and the social graces of diplomacy have taken place in the Blue Room. Preferences for oval rooms date to the time of George Washington. At the president's home in Philadelphia, Washington had two rooms modified with a bowed end and used them for hosting formal receptions called levees. As his guests formed a circle around him, Washington would stand in the center to greet them. With no one stuck in a corner, everyone was an equal distance from the president. The circle became a symbol of democracy, and Washington likely envisioned the oval Blue Room as the ideal place to host a levee. This room is not quite 40 feet by 30 feet. The "elliptic saloon," with the Yellow Oval Room above and the Diplomatic Reception Room below it, formed the most elegant architectural feature of James Hoban's plans for the White House. The Blue Room has always been used as a reception room except for a brief period during the administration of John Adams when it served as the south entrance hall. During the Madison administration, architect Benjamin Latrobe designed a suite of classical-revival furniture for the room, but only some working drawings remain; the furnishings were destroyed in the fire of 1814. Around 1870, President Johnson’s daughter Martha Johnson Patterson decorated the Blue Room in geometrical patterns. The room had blue wallpaper with black and gold borders, velvet carpets, and furniture from the Buchanan administration. When President Monroe redecorated the "large oval room" after the fire, he used the French Empire style, which is the present decor. The marble-top center table, that has been in the White House since it was purchased by President Monroe in 1817, stands beneath the French chandelier. This early 19th-century chandelier is made of gilded-wood and cut glass, encircled with acanthus leaves. George P. A. Healy's 1859 portrait of John Tyler hangs on the west wall above the Monroe sofa. It is considered to be the finest in the series of Presidential portraits Healy painted for the White House under a commission from Congress. A renovation and refurbishing of the Blue Room was initiated in the early 1990s by the Committee for The Preservation of the White House (with Clinton designer Kaki Hockersmith) and completed in mid-1995. The sapphire blue fabric used for the draperies and furniture covering is similar in color to fabric used in the room in 1800's. The silk upholstery fabric retains the gold eagle medallion on the chair backs which was adapted from the depiction of one of the Monroe-era chairs in a portrait of James Monroe. The blue satin draperies were derived from an early 19th century French source. The walls were hung with a light gold paper adapted from an early 19th century American paper with borders adapted from two early 19th century French papers. The upper border is a blue drapery swag; the lower border along the chair rail blue and gold with rosettes. Installation of a new oval carpet, based on early 19th century designs, completed the renovation project. The design was adapted from an original design for a neoclassical English carpet of about 1815, the period of the furnishings acquired by President James Monroe for the Blue Room. On June 2, 1886, Grover Cleveland became the first and only president to exchange wedding vows at the White House, and he and Frances Folsum did so in the Blue Room, accompanied by John Philip Sousa and the Marine Band. 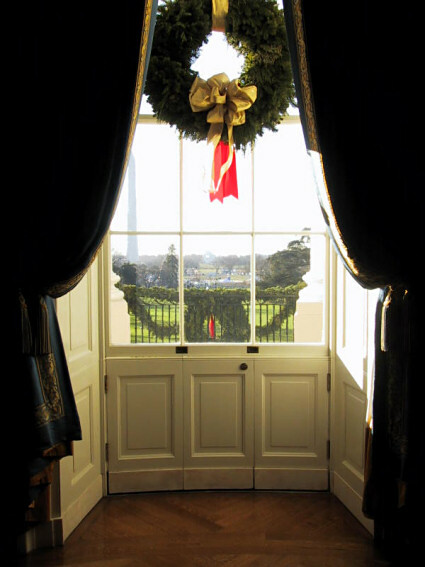 Although decorated trees can be found throughout the White House at Christmastime, the Blue Room is the traditional location for the "primary" Christmas tree. The tree is cut to 18 feet and erected in the center of the room, then wired to a hook in the ceiling to ensure that it remains stable. Then it can be decorated with the year's theme ornaments and decorations. The Blue Room's door to the South Portico porch is an unusual one. At first glance, it appears to be merely a window, and the window can in fact be raised like any other. But the portion below the window opens inward as a double door, allowing free access to the porch.